You have just completed the ACTIVE phase of your periodontal treatment, and now you are ready for the PREVENTIVE phase, keeping your gums healthy or what we call "MAINTENANCE THERAPY." You may have some questions about this Maintenance Treatment and we will try to answer many of them. Maintenance care is an on-going program designed to keep your gums (gingiva) and bone supporting your teeth healthy. Having just completed treatment for your periodontal disease, you are either disease free or your periodontal disease is in a state of arrest. WHY IS MAINTENANCE CARE IMPORTANT? Studies show that patients who follow through with periodontal maintenance therapy will do better than those who do not comply. Non-complaint patients have a greater tendency to need further periodontal treatment and are more likely to lose additional teeth. You have been shown that you are susceptible to gum disease. The bacteria which cause periodontal diseases are always present in your mouth, and constantly attack your gums and teeth. Therefore, it is absolutely necessary for you to do everything possible to prevent your periodontal problems from recurring. This will be determined based upon evaluation of your own periodontal condition. Since the bacteria responsible for periodontal disease are capable of causing a reoccurrence between 2 to 4 months after your last maintenance visit, your appointments may be more frequent than in the past. MY INSURANCE WILL ONLY PAY FOR APPOINTMENTS EVERY SIX MONTHS. IS IT “ABSOLUTELY NECESSARY” THAT I BE SEEN MORE FREQUENTLY? Insurance companies are not considering the needs of the periodontal patient when they wrote policies that pay for dental examinations every six months. For many years dentistry has lived with the concept of seeing your dentist twice a year. However, this recall interval has not been shown to be adequate to maintain periodontal health. DOES MY PERIODONTIST LOOK FOR CAVITIES, AND WHAT IS DONE IF ONE IS FOUND? Your periodontal maintenance appointments are not meant to take the place of your regular check-ups at your general dentist´s office. The purpose of periodontal maintenance appointments is to concentrate on the health of your gums and bone around your teeth. Your general dentist remains primarily responsible for evaluating your mouth for new cavities, changes in fillings, crowns, bridges and other dental problems. However, your maintenance visit in your periodontist´s office will include a screening for tooth decay (caries). 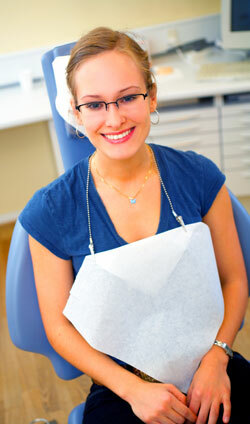 If cavities are detected, you will be referred to your general dentist for treatment.